Karin Tydén is visiting Bali on a quest for the good and healthy life. I am very pleased to learn that she has eaten well and I hope you will enjoy her report! Change Your Life and Perspective in Ubud – Part 4. 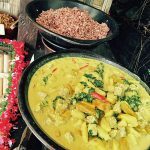 There are many opportunities to start eating healthily in Ubud. This is a city where the big fast food chains has not established themselves and it is very easy to find good and tasty food here. 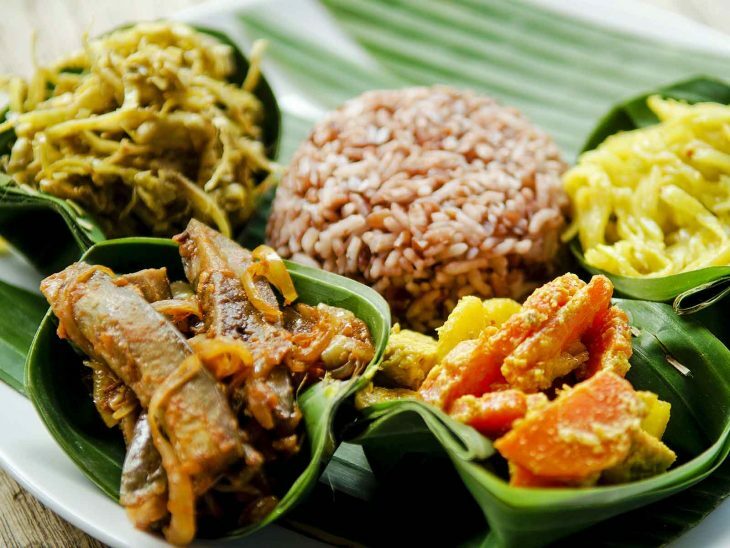 Many restaurants in Ubud serve home-grown organic food. 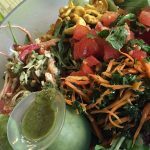 The most popular restaurant amongst yogis and raw food enthusiasts is probably Alchemy Bali who offers a delicious salad buffet where you pick and choose for about 4US$. In addition they offer about juices and smoothies with very cool names such as Insane, Basil Lips and Bee Here Now. You can also buy vegetables, sweets and other good stuff in their shop. If you are lazy, go for Alchemy´s home delivery which costs about a dollar. I would like to see more of this in Sweden! Beautiful dish at Alchemy Bali. Slightly smaller and more down to earth is the café named “Down To Earth” which is located on the same street as well-known Taksu Spa. 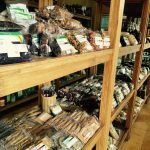 Here you will find raw food, macrobiotic, vegetarian and vegan food. Everything is organic. Their shop on the ground floor has a better choice of nuts, snacks and health food. Down To Earth Restaurant in Ubud, Bali. The shop at Down To Earth in Ubud, Bali. The Yoga Barn offers a vegan, vegetarian and macrobiotic buffet for only 5US$, which is very popular. My advice is to book your table early! One of my favourites is Taksu Spa which is very centrally located in Ubud. Raw food, vegan and regular. Their fish is delightful. Calculate 10 – 12US$ for a meal. This is where you will find food for almost any taste and is highly recommended! 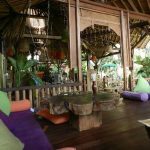 Another restaurant for most preferences is Swasti Eco Cottages in Nyuh Kuning which is a 5 minute scooter ride from central Ubud. Raw food, vegetarian and regular food a reasonable prices. All vegetables, spices and herbs are grown just by the restaurant. Swasti Cottages in Ubud, Bali. 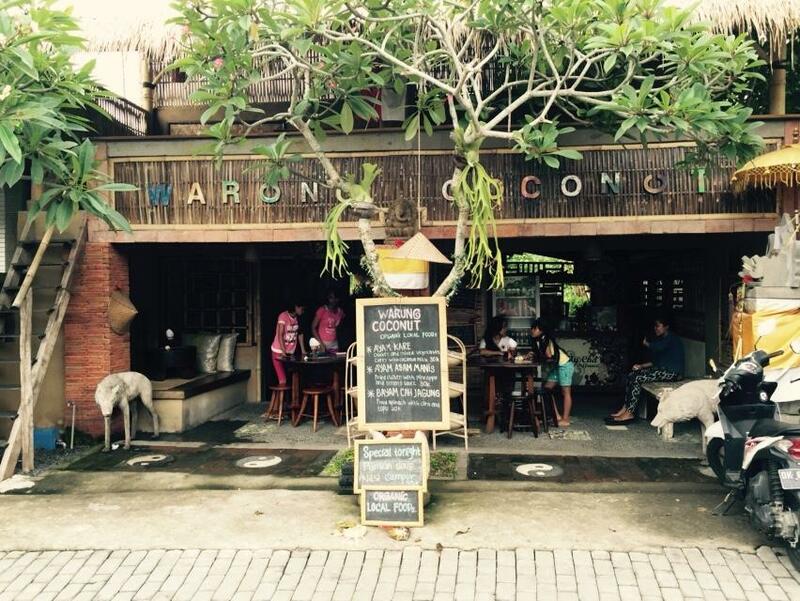 If you want a simple but good meal from organic produce, then you should visit Warung Coconut in Nyuh Kuning. 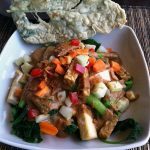 Wholesome, homemade Balinese food for about 2 – 3US$. Warung Coconut just outside Ubud, Bali. Editor´s note: Do not underestimate a warung (simple restaurant) if you are looking for good food. The ambiance and surroundings are usually very basic but usually serves good, tasty meals at reasonable prices. If you are looking for something special, I do recommend Sari Organik. Unfortunately, they do not have a working homepage but you will find Sari Organik´s details on Lonely Planet. 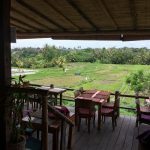 The restaurant is in the middle of the rice paddies and well-known for both the food and the view. This is where you can see people passing by or working in the rice fields during the day and enjoy the crickets humming at night. 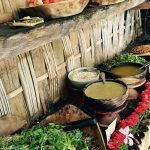 You have a choice of dining inside the restaurant or in their cushioned, alang-alang roofed bales. Editor´s note: read more about Indonesian architecture and a bale on Wikipedia. Sari Organik Restaurant in Ubud, Bali. Gado Gado at Sari Organik Restaurant in Ubud, Bali. View over the rice paddies from Sari Organik Restaurant in Ubud. Everything at Sari Organik is grown at their own farm which is integrated with the restaurant. The menu is small, with both meat and vegetarian, but well carried out and reasonably priced. Calculate about 3 – 6US$ for a main course. Located about 30 – 35 minute walk or 10 – 15 minutes on a scooter from Ubud (depending on where you start). Reservations recommended and definitely worth the trip! Rent a scooter to explore the surroundings and enjoy the eateries around the rice fields. Cheap and wholesome food of good quality. My stomach has behaved and if it should not, there are plenty of healers around Ubud. 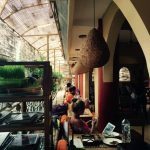 This is a great write-up on organic & Raw Food Restaurants in Ubud. I would love to see more tips flow in the comments on Twitter, on Facebook or in the comments below. I would like to send a huge thanks and gratitude to Karin for sharing invaluable tips during her trip to Ubud. 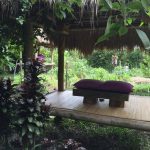 If you enjoyed this report, then I think you might like Karin´s reports about yoga, detox and healers in Ubud too. You will find all articles on Bali here. Working at the Main Desk at a London Airport. I love Bali, and your photos make me want to hop a plane and go right back. So decadent! Thanks for linking up with Weekend Travel Inspiration! Glad to meet another Bali-lover. Thanks for your kind words! Bookmarking this for my trip to Bali in November! So excited! Thanks for joining Weekend Travel Inspiration! Thanks a lot. I hope you will have a great time in Bali! !